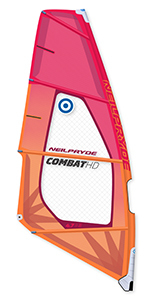 The Combat remains in the Neil Pryde range as their ‘Core Wave’ offering, but is joined by the X:Wave – a more price pointed all-round wave sail based on the 2018 Combat. As such, it has enabled the Combat to evolve with “dynamic and aggressive sailors” in mind, retaining the overall shape, but with a revised batten layout, seeing more space between the lower battens and less between the head battens. The resultant effect is that the belly of the Combat is liberated, releasing willingly and expanding as the wind fills, whilst the increased structure in the head of the sail retains the top end stability. It has allowed designer Robert Stolj to reduce the seam shaping in the sail, (leading to flatter battens and a shallower profile without diminishing bottom end power), with the intention of making the sail feel more neutral in transition. The Combat retains the brand’s highlighted structural hallmarks of its predecessor, such as the ‘Fuse Pocket Construction’ (integrated batten pockets for improved symmetry between tacks) and ‘Powerfuse’ laminates, strengthening the sail’s panels in key areas, whilst reducing weight. It comes in three colour options – this purple/black on test being the colourway for standard construction, whereas there are two colour schemes for the HD all x-ply version. We were given the Combat in 5.3m for this test as the smaller 5.0m wasn’t available at the time. That said, this 5.3m has comparable dimensions to others in the group, giving you an idea of the Combat’s compact nature. In marginal winds the sail was set on the TPX100 with minimal tension, the leech only loose in the top panel. 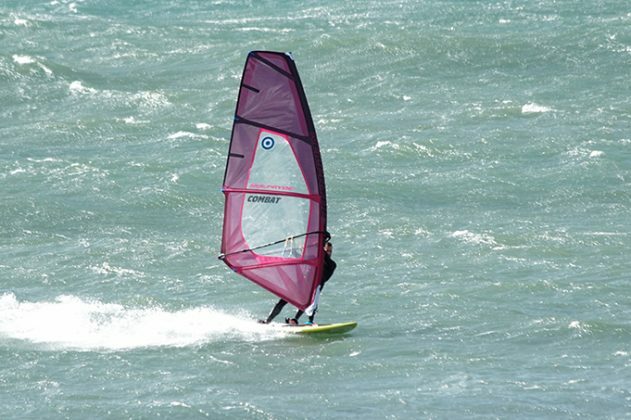 As gusts hit, the power comes on smoothly and evenly – rather than punchy or sharp, the delivery is soft and balanced, capable of being feathered through the back hand and transferring seamlessly into the board. It is certainly subtler than we remember of previous Combats, but play with its tuning range to tighten up the mid-leech and its pumping potential is there to be exploited. Once going, acceleration is rapid and its efficiency is immediately apparent – it seems to cut through lulls effortlessly and translate any extra power into speed, pointing high upwind whilst remaining light and positive in the hands. This softness and ease become real assets in transition, the Combat rotating fluidly before powering back up progressively. In extreme conditions, the sail can be re-tuned with increased tension, the leech twisting off further whilst the draft becomes relatively flat at rest. It copes incredibly well, even in wind strengths well out of its comfort zone, the stability locked forward whilst the pressure in the back hand remains manageable. 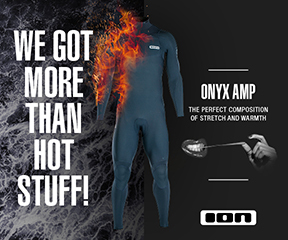 For those that demand a more direct nature and constant feedback, the Wave:X could be the better option, but for those looking for a softer smoother delivery with supreme neutrality at critical moments, the Combat delivers. With a revised manoeuvre-oriented focus, the Combat provides serene power over a wide wind range, with the appetite for going incredibly neutral on demand.